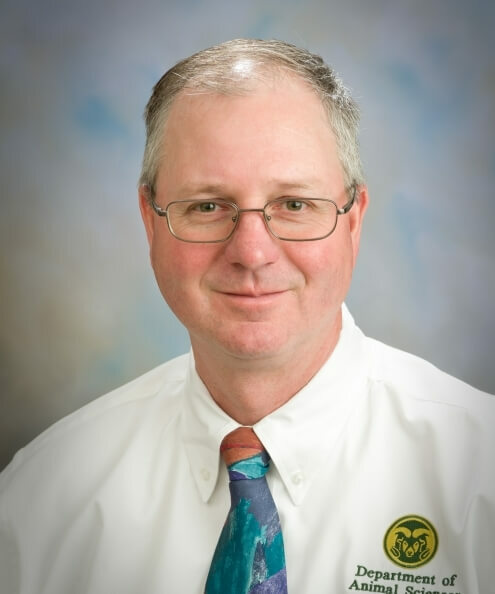 Milton G. Thomas joined Colorado State University in December 2011 as professor and John E. Rouse Chair of Beef Cattle Breeding and Genetics in the Department of Animal Sciences. Thomas grew up in a family involved in diversified agriculture in Texas and Missouri and was active in FFA leadership. He completed undergraduate, graduate and postdoctoral studies in animal science and molecular biology. He eared his Bachelor of Science in 1988 and his Master of Science in 1990 from the University of Missouri and his doctorate in 1994 from Texas A&M University. He did post doctoral studies at the University of Missouri and the University of Texas Institute of Biotechnology–Center for Molecular Medicine. Thomas progressed through the faculty ranks in the Department of Animal and Range Sciences at New Mexico State University from 1997 through 2011. In addition to undergraduate and graduate teaching, his responsibilities included coordinating the Angus, Brangus, Brahman cattle breeding program on the Chihuahuan Desert Rangeland Research Center and the Corona Range and Livestock Research Center. Thomas helped use these experiment station resources to grow the breeding program into the realm of animal genomics, which is also his role with the Rouse Angus herd at CSU. His ability to lead these research efforts has been aided by sabbaticals at University of California, Davis, and Commonwealth Scientific and Industrial Research Organisation--Australia and service to breed improvement committees of several breed associations. Thomas has published more than 425 professional articles as abstracts, experiment station reports and Western Section American Society of Animal Science proceedings. More than 90 of these documents are in peer-reviewed journals and proceedings. Thomas has served on the editorial boards of Journal of Animal Science, Domestic Animal Endocrinology, and Theriogenology. He has accrued more than $3.3 million in research and agriculture experiment station funding. He also helped support agriculture experiment station cattle breeding programs by marketing more than $1.7 million of breeding bulls. Through these teaching, research and service endeavors, Thomas has trained more than 23 graduate students and postdocs. He has also mentored more than 30 undergraduates interested in research. He received the Distinguished Research Award for the College of Agriculture and Home Economics at New Mexico State University in 2004 and then served as the Gerald Thomas Chair in Food Production and Natural Resources, 2010 to 2011. This one-year position internationalized collaborative study of genomics and heifer fertility. Thomas is a 2011 graduate of the Lead21 program and served as director at-large and recording secretary of the American Society of Animal Science from 2008 to 2010. These leadership activities helped prepare Thomas for the challenge of leading team-based genomics research with the CSU Beef Improvement Center (Rouse Ranch) in Wyoming.